God's Bounty again has been the recipient of the Simply Give campaign thru Meijers on Southport Road. Today and tomorrow, June 3 & 4, will be double match day. Buy a $10 donation card from the Simply Give kiosk near the checkouts and Meijers will give $20 making your total donation $30. That's an awesome deal!!! The campaign will continue until June 19 where Meijers will give $10 for every $10 donation which is still great. If you can, hurry to Meijers to take advantage of the double match and help feed the hungry in our community. God Bless! Yes, there is a Santa! Thank you Santa for making a stop by the pantry during your busy schedule in December. I know it's a late thank you, but we so enjoyed seeing your bright smile and hearing your "ho ho ho"! Thank you to Girl Scout Troop 964 for providing their beautiful artwork to some of our pantry bags that our clients can take with them once filled with food. Great job! Civic League - We Thank You! Again, the Civic League was very generous in giving God's Bounty their surplus of canned goods totalling 2,867 lbs. In January Tom Jones, Mike Fengya, Daryl Swain and Sherry Elder helped me bring the food to the pantry. Great job guys! 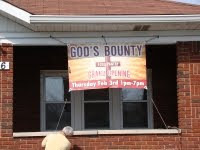 God's Bounty is a not-for-profit food pantry that exists to distribute food to the needy in Franklin Township, Marion County, Indiana and surrounding area. Our purpose for distributing food is to provide supplemental food to clients who are having difficulty providing food for their families. Our on going effort is directed towards soliciting funds and food donations in order to meet the needs of our clients. The Franklin Township Minisiterial Association saw a need in their community for an assistance program. A food pantry was discussed and that idea was presented to their congregations. In the Fall of 2010, those interested from all the churches came together and the Steering Committee was formed. There was so much enthusiasm that work soon began on the building that previously had been the parsonage of New Bethel Baptist Church. A wall was taken down, shelves were built by volunteers, furniture was donated, food donations came from those churches, freezers and refrigerators were brought in and by February 3, 2011 the doors of God's Bounty, Inc. were open and ready for clients. Unfortunately, there was a coating of ice on the trees and streets of our community that morning. Out came men with trucks and shovels, removing the ice from our parking lot and sidewalks, but we had no one venture out to our Grand Opening. Every Thursday, since then, we have served many families from Franklin Township and surrounding areas, sharing our “bounties” with our neighbors in need. Copyright © God's Pantry, Inc., All rights reserved. Simple theme. Powered by Blogger.